The whole world thinks Björk is mad. Mark Frith begs to differ. You can’t miss Björk. If she’s not on ITV Chart Show or Top Of The Pops, chances are you saw her face peering from the cover of several other magazines when you bought this issue of Smash Hits. This Sunday she will celebrate her fourth Top 30 hit of the year with Big Time Sensuality. It will probably be the biggest of them all. Her album has sold hundreds of thousands of copies in Britain alone. Radio DJs love her too— and not just the trendy ones. Rarely does an hour of the Steve Wright or Simon Mayo show pass without them playing her records, and without fail to a man they will comment about her “bonkers” she is. “That’s mad Björk” they’ll say or “That’s Björk—she’s not mad at all, is she ?” Why does everyone think Björk is mad ? 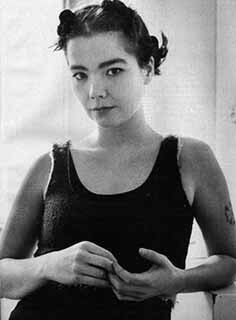 Björk Guðmundsdóttir, 27, is difficult to figure out and that is why she freaks people out. There’s her voice for starters : a curious mix of purring native Icelandic phrasing with the off “Laandan” accent at the end of sentences. Then there’s how she looks : part bolshy, screaming, self-confidence, part-innocent excitement. And there’s the things she talks about. One minute it’s her cat and flying kites, the next her favourite scientists. Maybe people find it simpler to write off these contradictions as her being mad. And they do. And she doesn’t give a damn. At the age of five, Björk was living in a hippy commune with ten other people. She was the only child. And she loved it. She would sit in and read her Prince Valiant books, listen to music “24 hours a day” and play with the cat. It was all very idyllic. And at the age of ten it all came to a crashing halt. The commune broke up and each family member was left to make it on their own. The [family] moved to the industrial side of Reykjavík and near-poverty. Aged 11, Björk made a record which helped out paying the bills. It sold 7,000 copies, a large amount for Iceland. She began to hang out with musicians three times her age and had music training. She was a starlet, a child prodigy. She hated it and she wasn’t the only one. So she did. In her late teens, as the group of friends grew up, they formed a loose collective of artists : painters, dancers, musicians. They called themselves Bad Taste—“because that’s what everyone said we had”—and put on plays and exhibitions. Björk would help out with the lighting for a theatrical production or move tables for a craft exhibition. One day, for a joke, six members of the group decided to form a pop band called The Sugarcubes. It was at this point that the world was introduced to Björk— and the “weird” tag appeared. Her first single Birthday was a dramatic, atmospheric tale of a bizarre childhood. In her first British interview she appeared—all five foot nothing of her—perched on a massive chair with her legs dangling above the floor, like a baby in a high chair. And much to Björk’s and everyone else’s surprise all this—and some brilliant moody, catchy songs—made them quite famous. 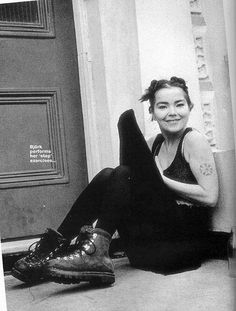 Björk was a pop star. Being away from Sindri hasn’t been the only think Björk has had to get used to this year. She’s bewildered about why she’s on the cover of every magazine. Björk may have had an unusual life so far but she’s not that weird. A little eccentric maybe but hardly mad. It’s just that she’s so different to your Joey Lawrences and Bad Boys Incs that people are bound to talk about her with great interest and fascination. But still she gets the weirdo descriptions. Strange, loopy, elfin and the one she is most bewildered by : child-like.